I will admit I'm only at book 3, but these are so mediocre it's unreal. The story's are contrived waffle with twists and developments straight out of a 20s plot wheel. Characters that aren't bland are just annoying and the ones that aren't annoying are downright murderable (looking at you, Roxy). So far the mysteries have been about as difficult to solve (including who, how and why) as a one-colour Rubiks Cube. Even the usually excellent Bray can't lift this one. it was free yet I still feel ripped off. The narration was excellent but the story was cobbled together junk. Banal and painfully derivative. Even though it was free I felt oddly cheated. Worst of the series by a mile. The inconsistencies in language and deeply flawed world building are starting to grate and get irritating. Story and characters are coming a distant second to cramming in as many bone headed and derivative ideas as possible. 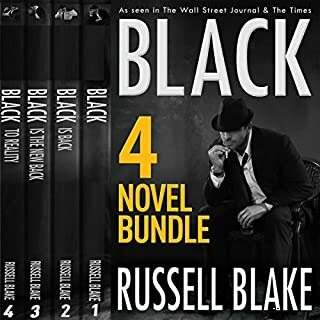 Not a brilliant series anyway it was good enough to sustain to book 4. Think I'll give 5 a miss. As painful as it is funny, as funny as it is painful. Brilliant books but sometimes it's a hard listen. Pulls no punches, acerbic, bitter, bittersweet and full of melancholy. At times the writing is sharp enough that you feel it might cut. 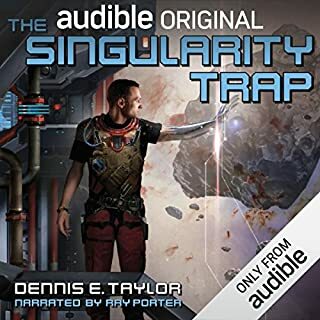 Not a patch on the Bobiverse books, but solid enough sci-fi and a good listen. Just lacked a spark and felt like a promising premise lost it's way a little as the book went on. Basically I have two main criticisms. The first is the narrator who was just a terrible choice for this book. His voice has now depth to it, no gravitas, and listening to characters who are meant to be hard-bitten sea-faring types is akin to hearing teenagers role-playing practising their all 'grown up and stuff' voices. 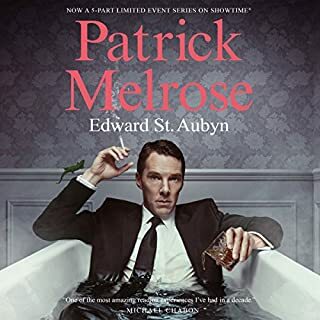 As a comparison, I'm now listening to the Patrick Melrose novels narrated by Alex Jennings who's capable of giving clear and distinct voices, across accents and gender, and can thus give his characters both variation and life. Sellwood just wasn't up to this task. The second criticism is of the book itself. If Stephen King can be accused of 'verbal diarrhoea' in the length of density of his books, then Dan Simmons must do his writing from the toilet seat. Good grief but the man can waffle, especially towards the end of the book and in particular the last chapter or two which should be full of melancholy and atmosphere but instead seemed to be little more than the other showing off his 'Inuit to English' dictionary. Another occasion where I find myself distinctly in the minority. How this has 4.5 stars baffles me. 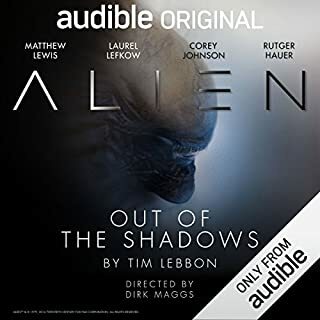 So, yeah, two main criticisms of an audiobook; the audio... and the book. 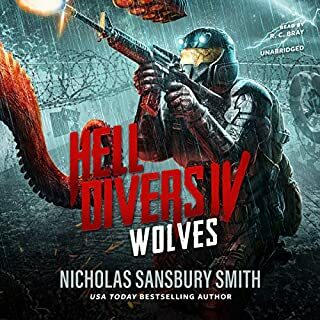 As a rule, I find something that has consistently high reviews (and plenty of them) can be relied upon to deliver to some degree. This is the exception to that rule. 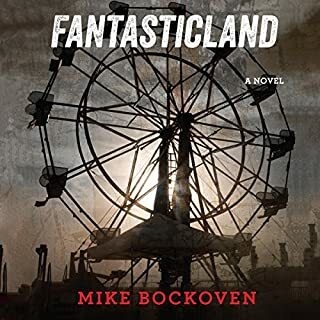 FantasticLand is billed as Battle Royale meets Lord of the Flies, and I'm not sure which one of those should feel more insulted by the comparison. It's nothing like as smart and controversial as BR, and falls laughably short of the genius of LOTF. 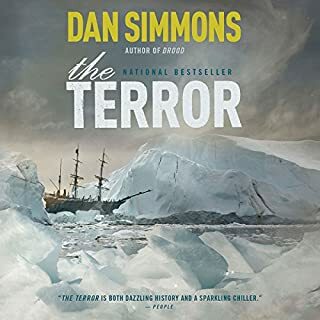 It's written from the POV of multiple witness testimonies given to the author of a book about what went on in a theme park cut off from civilisation, which stretches the vocal talents of both narrators. The premise is that an insanely powerful hurricane isolates a theme park that was already remote, leaving the remaining staff (ostensibly to protect it from looters and other such contrivances) isolated for weeks. During that time, society breaks down. It's gradual at first, but accelerates as time passes and supplies dwindle and... oh, wait. No, it's not gradual. It happens pretty much after one day. Apparently, deprive young adults from internet access and Facebook, and murderous mayhem will quickly follow. Supplies are plentiful we are repeatedly told, food and water both, and yet long-pig is apparently on the menu at some point. So next thing you know, factions are formed, atrocities are committed and before you can say 'well that didn't take long! ', corpses are swinging from lamp-posts. What characters there are seem thin at best, often little more than roughly sketched caricatures whose motivations are equally flimsy. Also, a flood of the park keeps people from moving out beyond the main contested area, and yet several characters just wade out, one even setting up on his own in a luxury hotel until he's visited by two other characters who also make this seemingly impossible journey. This hotel, by the way, is one of four and, far as I can tell, no-one else seems to think wading through some foul water is a better option that being beaten to death. The book is full to the brim with such inconsistencies which, even when they are justified, smack of little more than contrived conveniences. Another example is that no-one is allowed to keep their phones, that they're all stored in staff lockers in a distant part of the park. So distant that early on, two characters go out there and loot the place. No-one else even bothers. Towards the end, the writer doing all the interviewing asks why all this happened, and why so fast and so violent. His conclusions are half-baked commentaries on social isolation, reliance on technology and how teens left unattended will naturally follow the first psychopath who shows them where the stabby things are. Rosario Dawson is an excellent narrator, and pitches the characters pretty much perfectly throughout. The one criticism I have is that, whilst she can do accents very well indeed, she needs to work on having a bit more variety with non-accented voices. Without an accent, sometimes conversations were hard to follow as she would have multiple characters using pretty much the same voice. Minor complaint. On the whole, an excellent job. And that's the good out of the way. The story, such as it is, is contrived to the point of being able to spot pretty much every twist, plot point and story development way in advance. No surprises, precious little originality and characters doing things that are either borderline inane or so boneheaded any sense of immersion is shattered beyond repair. 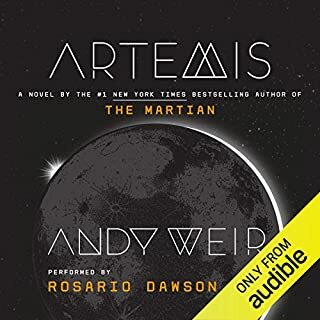 The moon as a location works up to a point, but Weir seems torn between world-building and story-building and does neither very well. The Martian walked this line very well because the character of Mark Watney held it all together. Jazz Bashara, who is actually a good character, isn't up to that job. 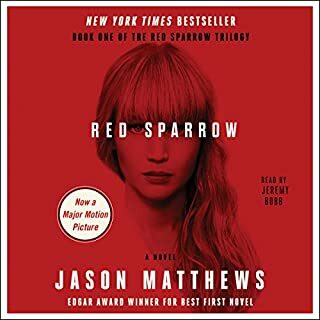 It's like the character belongs in another book, because with Dawson behind the vocals, she has a genuine life and presence, she just feels like Weir doesn't know quite what to do with her and so keeps shoving her as a round peg into square holes, making her a kind of story based Swiss Army knife, a tool for every situation. Also, some of her dialogue and actions in the story, as well as her pop-culture knowledge, jarred badly. All in all, this feels like that difficult second album, with the pressure of following up The Martian likely a factor in why this one doesn't work. Maybe his third will suit me more. An agent who Bend The Rules. A beautiful woman who is Irresistible To Men. 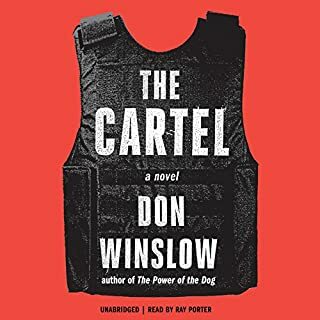 A drug dealer who is A Ruthless Killer. Irish mobsters who are Violent and/or Drunk. A priest is Strong and Moral. And on and on it goes, cliche after cliche. But... it works. Really well. It's not a work of genius but it's perfectly solid, a proper page-turner, decently written and Ray Porter, as always, nails the narration. Decent spy caper thoroughly undermined by being way too long and featuring possibly the dumbest, most contrived and shabbily written spy handler I've come across. And every staggeringly illogical and inexplicably unprofessional action her takes can be explained by love. The narrator was flawless though and deserved better than this drivel.